Nigerian singer, 2baba and his wife Annie Idibia joined activists across the country on Monday, May 28, to observe a national day of mourning in Abuja over the widespread and incessant killings in Nigeria. Before now, several states including Benue, Taraba and Zamfara have been hit by persistent violence caused by herdsmen, and others caused by armed bandits. The activists took to the streets of Lagos and Abuja to draw attention to the state of affairs in the cpountry, with the hope that more urgent and effective action will be taken. Other notable Nigerians who supported the campaign includes Bishop of the Roman Catholic Diocese of Sokoto, Mathew Hassan Kukah and Co-founder of BudgIT, Oluseun Onigbinde. 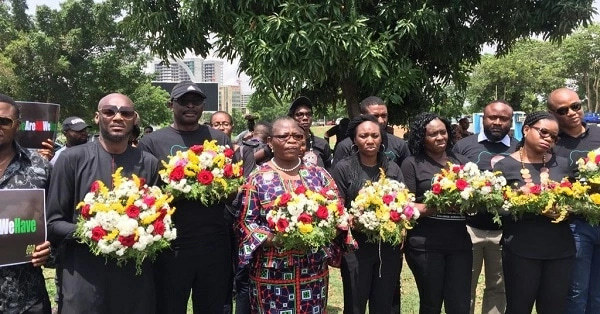 Annie Idibia took to her Instagram page to share photos and captioned: "This Morning At The Unity Fountain Abuja To Mark The National Day Of Mourning For All Victims Of Violent Conflicts Across Nigeria. #nationaldayofmourning #nigeriaMourns #OneDeathTooMany #WeAreAllWeHave"
2baba had earlier shared a post prior to the rally on his Instagram page which he captioned, "#Sadreality .........but we shall overcome"
National Courier's Lifestyle page wires top Fashion plots, sparkle tips, cooking designs what's more all the flourishing and thriving related issues and tips moreover. BUHARI’S YEARS ON THE SADDLE: Another Wasted Opportunity. Ben Bruce Reaction to Court's Decision vs Nigerian Media Users!!! Buhari for 2019? : Think Again! Kenny Blaq releases new comedy video skit..